Pad is made from 2" thick orthopedic foam which provides comfort & support. Meets the CAL117 requirements and is formaldehyde free! Waterresistant cover. Made from 100% polyester, is removable for machine washing. This Mission-style desk is practical with straight edges from the legs up to the flush pencil drawer and Mission desk top. Atop the desk, triangular side panels protect your work space and sensitive storage by offering a tambour closure. Pictured in oak with Medium Walnut finish. This distressed bookcase is pictured in pine with Seafoam - Distressed Antique. Adjustable Height - 16" to 20"
Busy kitchen? Even busier household? Put that extra space in your home to good use with a pantry cabinet. This expansive pantry cabinet has both beautiful style and ample storage for your dried and canned goods as well as kitchen tools that aren't in use. The top compartment is ideal for keeping items out of the hands of little ones. This desk has a Mission top and panels all around that touch the floor. Only subtle arches decorate the base skirts. A file drawer, pencil drawer, and two other drawers are flush to store everything you need to get work done. Outfit your office with this mission style Amish rolltop desk! Our large roll top desk can be customized with your choice of wood type, finish, and more. On the 42” wide base, there are three pull-out drawers on the right side which are perfect for filing paperwork.Â Above the chair area, there is a wide pull-out drawer for everything you need to get your to-do list done.Â Underneath the roll-top are two additional drawers along with ten compartments for more storage.Â These compartments vary in size and shape to meet all of your needs.Â In addition, the writing surface of this desk has an opening to pull a computer charger or other cords through without adding clutter. The solid wood construction and Mission styling of this desk, with sweeping lines and parallel panels, mean it’ll be an attractive feature of your office for generations.Â Browse on Amish Furniture Factory for Mission-style chairs to pair with this desk! This Mission-style desk has long, straight legs and elegant side panels. Three flush drawers, including a file drawer, are plain and practical. A Mission top provides a clean simple workspace to a desk you'll use every day. Complete your office with one of the most practical Mission-style desks available. This desk offers extensive storage options with drawers and compartments as well as having a space for a desk chair. On the 42” wide base, there are two pull-out drawers on the right side which are perfect for filing paperwork. Above the chair area, there is a wide pull-out drawer for everything you need to get your to-do list done. Underneath the roll-top are two additional drawers along with seven compartments for more storage. These compartments vary in size and shape to meet all of your needs. In addition, the writing surface of this desk has an opening to pull a computer charger or other cords through without adding clutter. The solid wood construction and Mission styling of this desk mean it’ll be an attractive feature of your office for generations. Browse Amish Furniture Factory for Mission-style chairs to pair with this desk! Pictured in oak with CFS-12 Dark Walnut finish. 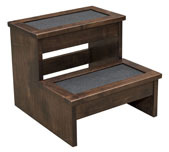 For a medium-sized bookcase that won’t break the bank, the economy bookcase is perfect. Constructed out of solid wood, the four shelves won’t warp, bend or break from your personal library. Don’t forget to ask the Amish Furniture Factory if you can stain the bookcase to match your home décor. There are also 36", 60” and 72” versions of this bookcase. Constructed out of nothing but solid wood and solid metal fixtures, this pie safe is built to last and impress. The doors of this cupboard feature four subtle panels with a beautiful, wood grain that will brighten any kitchen. The solid wood construction and metal latch drawer make this a durable option for even the busiest kitchen. The Noble Mission bookcase is a timeless and elegant way to showcase your books and other collectibles. This classically styled bookcase is made of solid wood with subtly styled details like arches and geometrically shaped feet. The bookcase has four shelves providing ample storage. With solid wood and world-class construction, this bookcase will become a focal point in any room for generations to come. Pictured in brown maple with Asbury Brown finish. Pictured in pine with Black - Distressed Antique.